A telemark skier on the Summit Bowl at Mt Stirling. Photo: Mt Buller/Mt Stirling Resort Management. Mt Stirling is my favourite day trip, or weekend getaway during the winter months. Just 230km from Melbourne, Mt Stirling (1749 metres) is a largely undeveloped and unspoilt alpine environment with beautiful snowgum woodlands and sweeping 360-degree panoramic views out over the Australian Alps. It's a special and unique place, offering a range of alpine adventure experiences. And, what's more, it's just a hop, skip and jump, past the bakery stop in Mansfield! ...introduce Mt Stirling to would-be backcountry adventurers who are keen to get backcountry, but are not familiar with the mountain or where to go. ...remind all you backcountry ski-tourers out there that Mt Stirling offers some great day, weekend and short-trip snow camping opportunities if you find yourself too time poor to venture further afield to get your turns. If you have never backcountry toured or snow camped before, Mt Stirling is also a great place to make your debut. 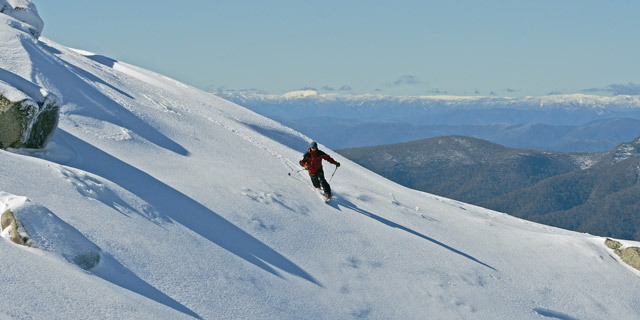 The area is extensively patrolled during the ski season by the Mt Stirling Ski Patrol. Stirling is accessed via Mansfield and the Mt Buller Tourist Rd. In winter, drive through the Mt Buller Resort gate at Mirimbah, hang a left and continue up Mt Stirling Rd to Telephone Box Junction (TBJ). During the ski season there will be a resort gate entry fee, which is a good reason to take a few mates along for the ride to split the costs. Most two-wheel drive vehicles should be able to make the drive up to TBJ, but you must carry snow chains during the ski season. NB: During winter no vehicles are allowed to travel beyond TBJ. At Telephone Box Junction you will find Mt Stirling's main hub, comprising the Visitor Centre, the Ski Hire and Ski School, the Mt Stirling Bistro, First Aid Centre and Ski Patrol. There is also a Public Shelter with a cosy fireplace. These services are operated by the Mt Stirling Experience. In winter, the Mt Stirling Experience also operates a shuttle service from Mirimbah to TBJ, if you would rather they did the driving up Mt Stirling Rd. Go to: www.stirlingexperience.com.au for details. All these facilities are only available during the ski season. Alpine Camp accommodation amongst snow gums at the Cricket Pitch. Photo: Mt Buller/Mt Stirling Resort Management. Mt Stirling Ski Patrol in action. Photo: Mt Buller/Mt Stirling Resort Management. In keeping with the semi-wilderness feel of Mt Stirling, there are no lift-serviced runs. You will be skiing on trails amongst snow gums – ahhh! A quintessentially Australian Alpine experience. Mt Stirling has 35km of groomed trails and 30km of backcountry trails to explore. If you have never skied before, it's a good idea to get a lesson to learn the basics, because this will greatly enhance your enjoyment of skiing. 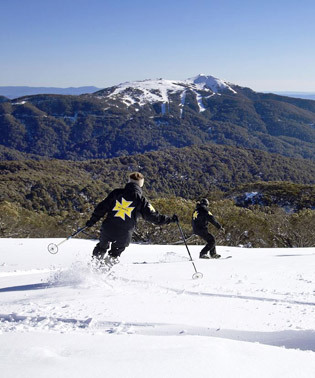 Mt Stirling Experience offer ski hire and ski lessons as well as packages. Most skiers at Mt Stirling will be on Nordic or Backcountry metal edged touring skis. The metal edged Madshus ski range (the Eon, Epoch and Annum) is ideal for this terrain as are the Fischer S-Bound 78, 88, and 98 series. We have all these skis, plus a full range of backcountry gear at Bogong, so come in and check it out - we'll get you kitted out with everything you need. If you're not ready to make that commitment, you can hire skis at the Mt Stirling Ski Hire or locally at The Wilderness Shop in Box Hill. 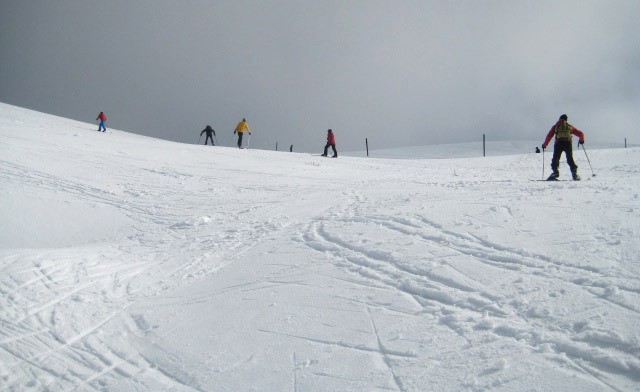 The alternative to exploring the mountain on skis is of course – snowshoeing. Snowshoeing is also a gentler way to get around if you're not happy on skis. Snowshoeing is increasingly popular in Australia and it's not difficult. The snowshoe, like the ski, is one of the oldest man-made inventions. The use of snowshoes dates back so far in human history that historians have been unable to determine the exact origin of either skis or snowshoes. The best guess is that the first snowshoe/skis created to facilitate easier snow travel probably originated in Central Asia, in about 4000-6000 BC. The "traditional" webbed snowshoe, as we know it today, has its origins in North American indigenous culture. So, when you're walking on a pair of snowshoes, you're really walking in unison with a very fine and long tradition! Bogong has snowshoes for either purchase or hire. Check out the MSR Evo 22, which is a great quality snowshoe if you are looking to buy. You can also hire snowshoes from us but get in early – they are in big demand during the ski season. Telemark skiers earning their turns on the Summit Bowl. For those keen telemarkers willing to earn their turns, you can ascend Bluff Spur Trail to the Stanley Bowl for some great telemark skiing opportunities. If you plan to do this in one day, then I suggest you start out from TBJ early, as it is approximately a 1.5- to 2-hour ascent to the summit area. And, obviously, you'll want to spend as much time as possible busting some turns at the top. For a fun tele-weekend, my suggestion would be ski up to Bluff Spur Hut and snowcamp there overnight, which will allow you plenty of tele-skiing time around the Stanley bowl area over two days. 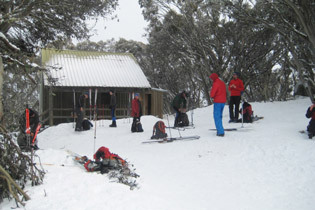 A few ski tourers arriving at Bluff Spur Hut. 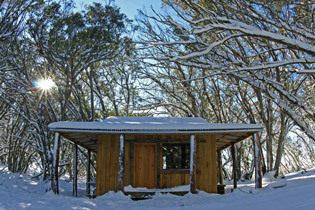 One of the huts at Mt Stirling. Photo: Mt Buller/Mt Stirling Resort Management. 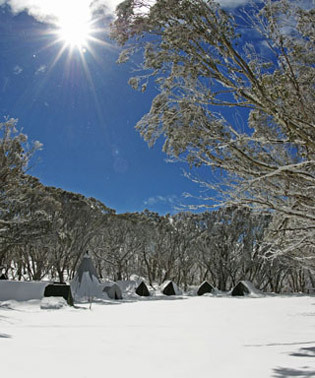 If you are new to overnight ski-touring and snow camping in the backcountry, Mt Stirling is a great venue to try this out. At Bogong, we have a range of gear for backcountry snow camping, and plenty of advice regarding what you should take. Before you go, you should definitely check out our Exped Downmats, which are a must-have item. Pair your downmat with a Mont sleeping bag for a perfectly cosy combo – then laugh knowingly and watch all your mates pretending not to notice how awesome your gear is. Just remember though, if you are inexperienced when it comes to snow camping, it is advisable to go in a group with some seasoned snow campers. Mt Stirling do advise that camping in the vicinity of Alpine Ash trees is extremely hazardous and not recommended due to the risk of falling limbs. All campers are advised only to camp in areas surrounded by snowgums or around the summit area. Areas recommended for camping within the resort include the Cricket Pitch, the Bluff Spur Hut area and the top of Dugout Bowl at the summit. So, there you have it – Mt Stirling. A winter wonderland waiting on your doorstep. Great article! I've been there many times. Cannot wait to be up there again this year on my new tele gear. :-) Bring on the snow!